bases, minor bugs removed, a few new static meshes added & finally, I have slightly widened both ramps to the red & blue flags. for the red flag, I have lowered the red flag base a bit & the ledge behind it to make this impossible to do. red players seem to spawn in there all too often and that gave a slight unfair advantage to the blues. Guess who�s back? And good timing too, many maps made for ut2003 have been converted to the new game with a bit of tender loving care and, if like me, you missed them first time round, you�re in for a treat. In Short: A fine example of how to bring old maps from UT back into the new millennium. If you liked it before, you�ll like the new version, if not, then give it a go anyway because it�s a solid map. Decent, if bland graphics support a technically perfect map. Notice: If you hate remakes of any kind, take 4 from the rating and you�ll be left with the author�s actual contribution. Now I�ll be the first to admit I�ve never been a great fan of Eternal Caves. I�ve never liked its simple, chokepoint style layout and it�s risky attempt at providing different styles of play for each base. In fact I�ve always thought the bases themselves were poor � the blue�s tightrope path to the flag compared with the narrow circular death trap that is the red base. This has influenced my cast score, but the map does fill it�s purpose, which is to bring the old map to the new game, and the map is very true to the original. It�s been rescaled to suit UT2003/4 of course, but it does feel perhaps a little smaller which is not necessarily a bad thing. For what it�s worth, the gameplay, despite the initial flaws, is not bad. The action usually takes place along the twisting corridors in the center of the map, and whilst this does not offer much in the way of height or z-axis fighting it does provide decent-ish gameplay. Weapons layout is fine too, I think it�s pretty much left alone from UT. I cannot fault the author technically, for the map has really undergone some care and thought. The map runs smoothly for me on my (sometimes underestimated) GF4MX420 on full details though with a rather low resolution. 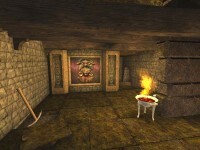 He�s made great use of the CTF-Magma style graphics and techniques without also borrowing its poor frame rates. The optimisation job is sweet. Although it can look bland in places, for a map like this it was a good choice to go for simplicity over hurting the frame rate. It fits the rest of the map�s design, in a sense. I love the subtle use of fluid surfaces for the cobwebs in the water room and for certain vines, it adds character to the map and is really quite simple. The same goes for the countless emitters, which although only slightly tweaked from magma affect the map�s awe scoring in a positive way. There are shaders set up too, a nice little touch. Sound wise, it hits the spot. Where the lava should roar, it roars. Where the humidity should cause moisture to rise and drip, it drips. 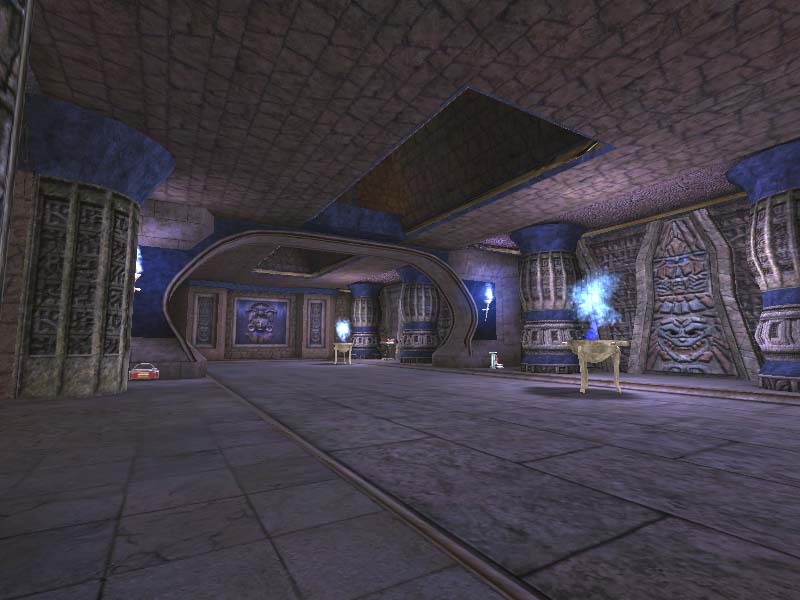 I also *think* there is EAX support in the central rooms, though I cannot be sure because I�ve never been able to get it working on my setup. Bots play well enough, BUT they do suffer on the blue base. On the few matches I played they kept trying to jump from a certain point off onto the narrow ledge and that made them oh-so-easy target for my rocket/shock. I�m glad to say that the author�s done a smashing job on how it looks whilst keeping to certain limits. It is not over-detailed to keep frame rates high, whilst it does not look ugly and cubic. In fact, it looks too smooth. For an ancient cave, it does lack jagged, harsh points in the rock�s shape. Nevertheless using similar techniques to the retail map CTF-Magma it looks great. 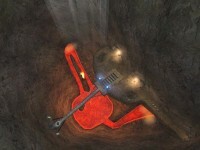 Much of the texture work was taken from the magma, and also the eye-candy features like the lava spitting �chimneys�. It�s warped around the level and it works wonders. It really helps the map fit in with the retail levels too, which in this case helps the map because it originally was a retail map. There are several cool little details, like the glare and rays from the outside. Some textures look ripped from UT, though I�m sure they�ve been worked on a little to bring them up to date. However, I do have to dock marks because it is bland and a little boring in places. 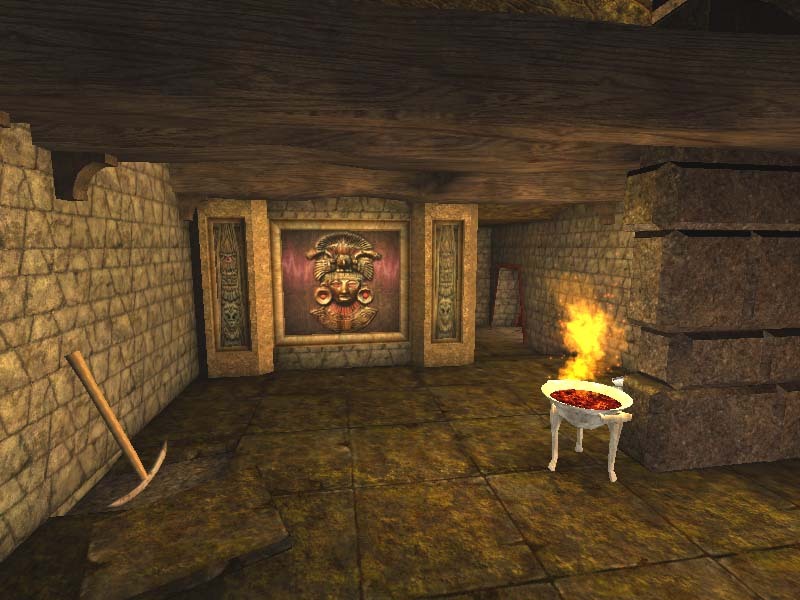 The rock, floor and wall textures get old quick, and they�re used everywhere. I like the all-destroying lava in the map; it�s dense enough to be almost believable without being buggy like some of the lava in the game. Atmospherical wise it feels correct. Perhaps it could have been made a little more creepy, or the intense heat made to be feriously in your face, but this would have taken from it's simplicity. So there it is, a decent touch-up of a remake of a remake. Heh, don�t let that put you off, the author�s done some good work and this map should be an example of how to get effective results technically. I�d love to see an original layout from this guy though; it�d be a good map if this is anything to go by. This is a pretty damned good remake. There were one or two spots where I picked out a corner in the rock formations that looked a little too sharp and unnatural, but aside from that, the map looks excellent. Of course we're all already familiar with how it plays. 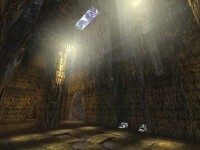 :) It was one of my favorite retail CTF maps in UT99, and it's still a lot of fun. Nice work Fordy. first off lemme say that this is a re-remake of a previous map so thats why i dont give a higher score. i love this one (as i did w/ the original UT map). And maybe this one plays better than the original (maybe because of the new size). You added the original Foregone track, i love that detail, its a plus. -Instead of these shiny metals used on the ramps to the flags and some other places, some kind of raw steel, or even old-lookin wood would fit better IMO. -water in a volcanic cave? well this is not a big prob but is there. -Why change the map description? 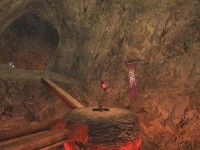 Wasn't the original ut map "a cave under the Arcane Temple"? EDIT: my comp runs magma smooth with the my default settings. wow, this map ownz. EternalCave has always been my favorite UT1 CTF map and this one even looks a lot better. A true remake. Epic you should have added this with the game :) . "-water in a volcanic cave? well this is not a big prob but is there." And the plain bit is for performance reasons. Would you rather play something slower like CTF-Magma? Or go at it with a nice smooth fps? Amazing stuff fordy :). Really like it how you modelled the cave. I'm just getting started with 3d max so it seems like magic to me. Rated with half an eye on user-ratings. This map has the "fun" factor. Almost perfect remake! A little bit new, a little bit old. Horray for UT99! The only thing I didn't like was how pain the ramp down to the blue side from the upper passage looks. Other than that, no complaints. Can't wait for the next remake! One of the best unofficial (go Teddie, go!) remakes. I think it's just perfect. =) Retail quality in every aspect. HA ha awesome to see the remake is back of a ut and ut2003 classic. I give it a 10 because of the tweaks and bug fixes excellent job dude keep it up!!! The 5 points is all for the quality of the construction for the map. the lack of the rest is for my not liking of the map layout itself. I never liked the original map, nor this one, for a simple reason. In a map that is symmetrical except the bases, the bases themselves are different in a horribly imbalanced way. The blue flag is much much much harder to grab, much less escape with, than the red one. Sure, u have to walk a bit further with the red flag, but it is so much easier to get off the flag base area. I'm not sure why this map was so popular in UT for this. If youre lagging, or are not perfectly precise in your movement while on the red team, you will never take that flag- you will kiss lava almost every time- perhaps even when youre not being shot at. All Remakes from UT to this game should be just like this! Perfect conversion! This is a very very solid remake, but it is unfortunately, just a remake. While a decent map and I recommend downloading it, I just don't feel it is worth more than this considering some of the really good original efforts that are around. Very good map! Perfect Remake of the original! I really like CTF-Magma lava style! Far better than the original, which I quite liked anyway... but then it was nothing spectacular. The lava is top quality, brilliant indeed. Trouble is, the only time you're going to see it is when you fall off one of the ledges, in which case you'll be swearing too much to enjoy it. The rest of the visuals are a mix: the terrain is similarly excellent, being all that a higher poly version of Eternal Caves would be... the rooms are pretty boring though, and haven't really advanced at all from their UT days. Still, a must download for all, and easily one of the best maps to show up since release. Really good re-make, lava looks great, it really made me feel like I was playing the original UT. i wish there were more decent ut99 conversions like this! some of the others ive played are crap! Real good remake, it's great fun! This is how remakes should be made! VERY great work! It even rivals the quality of the original. Wow,I must say this level is done very well,the flames cause damage (been looking for that in maps) and it has the same appeal as the first one.Fps stays nice and smooth too. Seems like it might be a tad bright inside,possibly. and the center swampy room is done to perfection. great job on the lava flows too. Definitly a keeper for me. @ hidra, yup a remake, but one that is really good. If you know how much time fordy has spend in the meshes, the cave and the lava. this isnt just a remake, and though some people dont like that a map is a remake you have to consider that some remakes from the old unreal deserve new life. the map itself was always loved by gamers and its map like these i kinda miss in 2k4. I expect a lot from remakes, and fordy lived up to those expectations. Return of a Classic. Owners of the original Unreal Tournament will already know this one inside and out; aside from a few pieces of environmental detail, every effort was made to preserve the spirit of the original - right down to the music. Visuals are generally sharp, while bots are on fine form, playing an aggressive - perhaps almost too aggressive - game. Lighting. The only sour note of an otherwise excellent map is the bland lighting, particularly in the red catacombs and shock rifle rooms. One can't shake the nagging feeling that darker areas with a sharper emphasis on light sources would have made for a slightly more compelling look. Polished, eminently playable update of an old UT warhorse. Veterans and newcomers alike will find a lot to enjoy in this one. Better a (nearly) perfect remake than a bad new map!!! I love this map!!! This is for me the best CTF map in UT99, together with CTF-Control. Nice, this brings back good memories! need more tweaking of lights and light radiuses. Good Job! This brings back the gameplay from UT99 with good longs to come along.... only lighting needs a bit more detail. Great job! I agree with SirTahnGarth about the layout of this map. I liked the remake made in UT where there are two of the same bases (two red-type bases I believe) and definitely a symmetrical CTF. Since this is a remake, I really can't fault it for that. I agree with most points in the review as well. One thing I would like to point out is the music file isn't the same length as the one for UT and this same file was released in the CDOM pack and UTClassics pack and was the same length as the original file. If the file isn't the same, then it should have been named differently so as to not conflict. Of course, this may not matter for music files but it would be nice for the author's music files to be played. Either that or the author of the maps that use this file in the mappacks mentioned should have used this Foregone.ogg file already released. Oh, YEAH!!! another great map remake! great job!!! The better quality. Old skool gameplay. I like it.